It is what it say on the tin. I'm tempted to use it to name my next homebrew (October is right around the corner). Taverns and inns are a common staple of fantasy settings; they are places where players meet, get into fights and do business. But what if they want to have a drink? 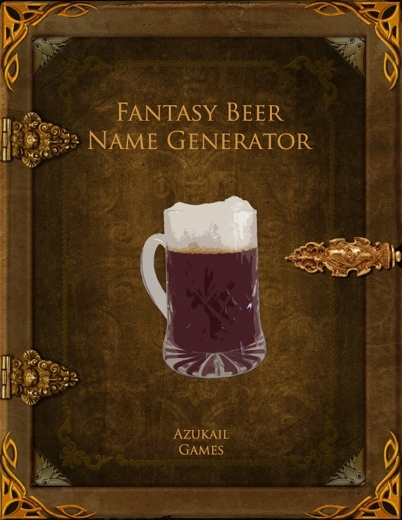 Rather than simply saying that they can have ale, beer, mead and so on, this generator has a set of seven tables that can be used to roll up a more exotic sounding drinks (or simply pick the names manually). A minimum of two tables should be used, but all can be rolled on for a more complex name. The tables have from eight to thirty results, and the results can be shuffled into a name for the drink, combining them with filler words so that the name makes sense. Two supplementary tables of thirty results each provide options to describe the drink's flavour. An example result, using all of the tables, would be Vale of the Green Orc Hunter's Best Ruby Mild, a drink with a fruity flavour and overtones of peaches. As well as being used to create fantasy drinks, these tables can be used for beer names in any setting or period, including modern, as they are not dissimilar to modern microbrew names.